Alien Armory Tactical is your local, family owned and operated full service gun shop. Located near Chesterfield, MO and easily accessible to anyone in the Greater St Louis area. We have a wide array of firearms and firearm parts & accessories. We specialize in AR parts and accessories and all of our products are designed and built by us or selected by us for their affordability and quality. We appreciate the confidence our customers have in us and we look forward to earning your business in the future. If you have any questions or comments please let us know how to best contact you and we will get back with you as quickly as possible. We are scheduled just about every weekend of the year as a vendor at all of the area gun shows. Stop by and say hello, we would love to meet you. Alien Armory Tactical offers full-service gunsmithing services. From simple cleaning to major repair, we have your back. Our highly skilled professional craftsmen and support team take great pride in performing the art and science of gunsmithing. We offer an extensive range of services at our Chesterfield area gun shop to help keep you in the field or on the range. Our gunsmiths excel in a wide variety of services such as stock fitting, wood refinishing, metal restoration, accessory additions, and special performance enhancing projects. As collectors and shooters themselves, our gunsmiths understand the importance of superior workmanship. We are equipped to handle restorations, basic mechanical repairs, and custom applications. Whether it’s an extensive repair or simply fitting a new accessory to your favorite pistol, shotgun, or rifle, you can rely on the pros at Alien Armory Tactical. We specialize in building AR-15 type firearms and tactical shotguns. We have the expertise, experience, and the parts available to make your vision a reality no matter how crazy it is. Our mission at Alien Armory Tactical is to provide the world with the best shopping experience possible by offering quality AR parts and accessories backed by world class customer service, all at affordable prices. We were founded in Chesterfield, MO based on a simple idea that has become the cornerstone of our business: To provide firearms enthusiasts, professional shooters, and servicemen and women the highest quality AR parts and accessories at affordable prices. That one goal has grown over time to include a broader selection of products, the best customer service you can find in the industry, knowledgeable staff that is always ready to field questions, and create value for our customers hard earned money. Every day we strive to find new ways to improve our product selection, customer service, and the way we help everyone find the right firearm and accessories to fit their needs. Today our business is built on a foundation of fast shipping, competitive pricing, and world-class customer service. We hope to deliver to all of our customers the best value possible by providing top tier products and applying the passion and knowledge we have for firearms to every order. At Alien Armory Tactical we’ve got it all right here in the Chesterfield area! AAT was created by people with a passion for firearms, tactical gear, and the great outdoors. Our goal is to give you access to everything you need from AR parts and Accessories to targets and ammunition. No matter what you’re searching for we’re here to help you gear up for the big hunt, add to your collection, or to help wit self defense and range shooting. 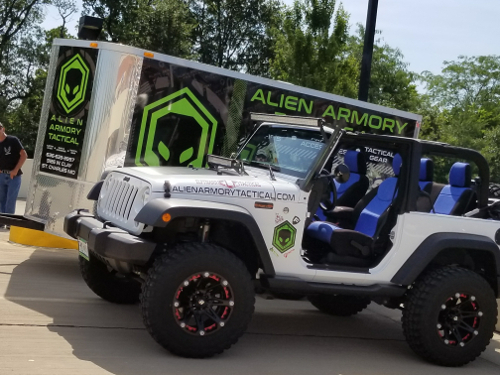 At Alien Armory Tactical You Can Shop a huge selection of tactical gear, firearms, ammunition, accessories and especially our AR parts and accessories. Whether you shop online or stop by to visit us in St Chales, MO or even say hello at one of the local gun shows we look forward to helping you find what you are looking for. If you have any questions or comments please contact us and we will get back with you as quickly as possible.